Hiking in the desert can be a beautiful experience that creates memories that will last a lifetime. However, if you’re not adequately prepared for the harsher conditions of the desert, then you’ll get an entirely different set of memories. The desert is as dangerous as it is beautiful if you’re not prepared, and there are several factors you need to consider as you plan your hike through such a terrain. Below, Ranger Mac will go over some tips to help you get ready for that desert hike. The heat can hit you fast and so can the medical conditions associated with it. Knowing the symptoms of dehydration, heat exhaustion, and heatstroke can make a huge difference for you and the other people hiking around you. Dehydration - This means that a person doesn’t have enough fluids or electrolytes in his or her body. Symptoms include thirst, headache, muscle cramps, dizziness, and fatigue. As dehydration progresses, you might also notice nausea, dry mouth, increased sweating or inability to sweat, and increasingly dark yellow or orange colored urine. When dehydration occurs in the heat, it can lead to heat exhaustion. Heat Exhaustion - This occurs when a person is exposed to extreme heat and doesn’t properly replenish the water or electrolytes in their body. During strenuous activity, your body can easily overheat and cause heat exhaustion before you realize it. While the symptoms for this are not life-threatening, if they are left untreated, it can turn into the more serious heatstroke. Indicators of heat exhaustion include the ones listed above for dehydration. If you start to notice any of them, you need to take the time to rest, cool off, and replenish the water in your body. Heatstroke - This is a result of the body being unable to regulate its own temperature. It’s important to take preventative measures so this does not occur by making sure you have enough water and take enough breaks to let your body cool down. Your body can rise to 104 degrees or higher very quickly. Other symptoms include fainting, confusion, lethargy, seizures, difficulty breathing, chest/abdominal pain, and increased heart rate. Heatstroke can be a life threatening condition if you don’t get yourself treated quickly. 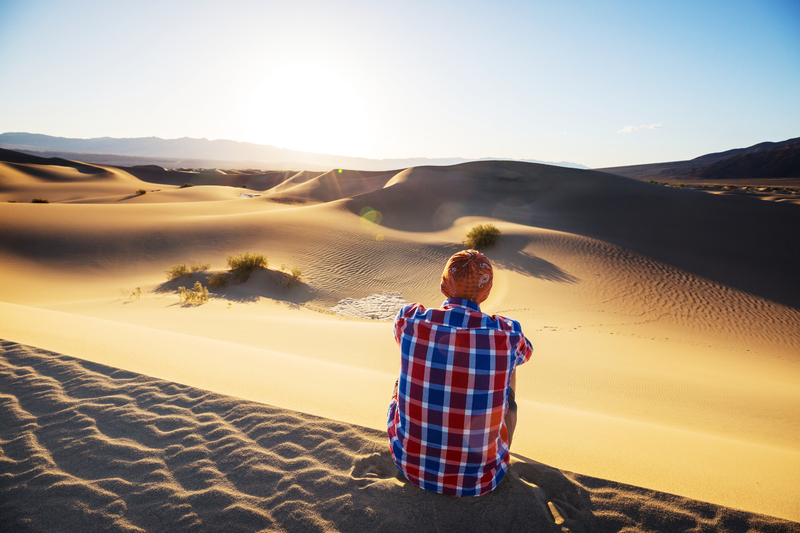 Deserts are known not only for the heat, but also for extreme temperature changes over the course of the day and year. Do some research on your hiking destination to find the best time of year to visit. However, hiking at the perfect time of year might also mean that you have to share the trails with a huge crowd. Weigh the benefits and risks of choosing certain months of the year. It’s also important to plan your hike around the right time of day. Some desert environments are very hot during the day and very cold at night, with a range of temperatures in between. If you can time the hike so that you’re exerting the most effort at a cooler time, such as first thing in the morning or later in the evening, it will make your trip much more pleasant. Between the hours of 10am to 4pm tends to be the worst time of day for intense heat and strenuous activity. Once you decide on a time and get out there on that hike, the hours can easily get away from you. Pay attention to how long you’ve been on the move and try not to overexert yourself or find yourself stranded in a bad area during the hottest part of the day. Drinking enough water is crucial for your health and safety on any hike, but it’s especially important for desert hikes. It's recommended that you bring 2 liters of water if you plan on being out for more than 2 hours, but if you’re planning on taking a short hike and take a bad step and twist your ankle, your 20-minute hike could leave you out in the elements for longer than expected. Take as much water as you can comfortably carry at the trailhead, and refill it whenever possible. Drink frequently to stay well hydrated before and during the hike. Keep in mind that water is heavy. Before you set out for your trip, estimate how much water you’ll need to carry, get the appropriate container, and test it out. If you can’t carry as much as you need, you must make sure that there are plenty of opportunities along the trail to refill your supply, or choose a shorter trail. When spending time in the heat, shade is key. Depending on which desert area you’re hiking, there may be plenty of places where you can take a break in the shade. You’ll find this useful if you become slightly overheated or short of breath. Take advantage of the shade when you can and rest up while breathing through your nose. Cool your body down so that you can hit the next part of your hike with renewed energy. It might seem counter-productive, but it’s actually helpful in the sun and heat to wear clothing that covers your body. However, you want the clothing to be lightweight and made of breathable materials. Long sleeves and pants are recommended so that your skin can stay protected from the sun and other desert elements. Make sure you pack for more than the hot, dry weather. Desert weather can change quickly and turn cool faster than you think. Packing layers is always a good idea for hikes. So is a wide-brimmed, sun-blocking hat and sunscreen! A cooling towel is something else to consider bringing on a desert hike. There are several kinds available that you can purchase to keep wrapped around your neck. These wraps stay cool when soaked with water for up to 4 hours. If you don’t want to purchase a special wrap, you can simply use some of your water to soak a regular bandana and wrap it around your neck, though this won’t stay cool for as long. You may think you know where you’re going, but it’s easy to get turned around while you’re out hiking, especially if you’re in the desert. Have a map of the area and stay aware of where you are at all times. Always keep track of where you are as you hike and check the map and compass frequently to have a safe and fun hike. Be prepared for your desert hike by planning ahead to wear the right clothing, bring enough water, and pay attention to your surroundings. By following these tips, it will make for a fun and enjoyable time in the desert, rather than an unpleasant experience. Don’t get overly confident as you walk the desert, because the surroundings can change very quickly. Stay alert and enjoy all the sights the desert has to offer. Happy hiking!